In today’s extremely busy society taking care of ourselves often comes second to the pressures of work, family life and a constant temptation to over-indulge. With time being a precious and expiring entity, even getting to the gym can be a workout in itself as you navigate the minefield of social and professional commitments that modern life throws at you on a daily basis. Here’s our answer to one of life’s greatest gripes, the all too familiar “I just don’t have time to stay in shape”. So you want to get fit then? Right, that’s the first bit out of the way. All great achievements start with a positive gearshift in mindset, and 50% of the battle towards better health is having the right attitude and wanting to achieve your goals. 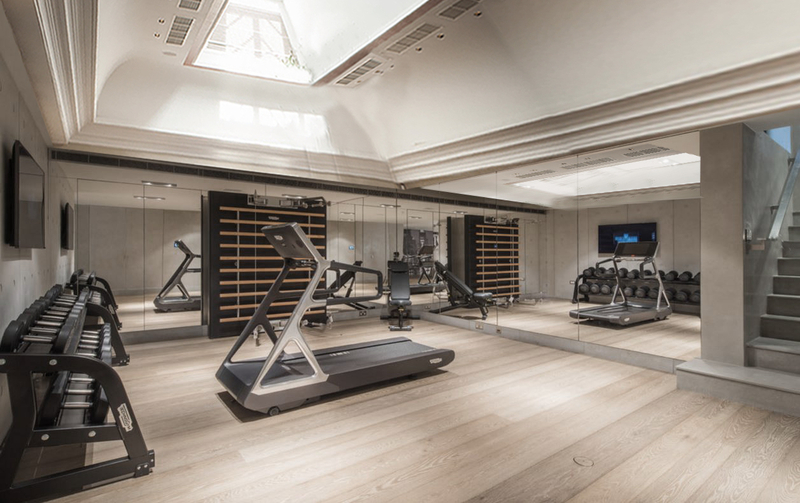 You don’t need to own a sprawling mansion or a superyacht to have your own home gym either. 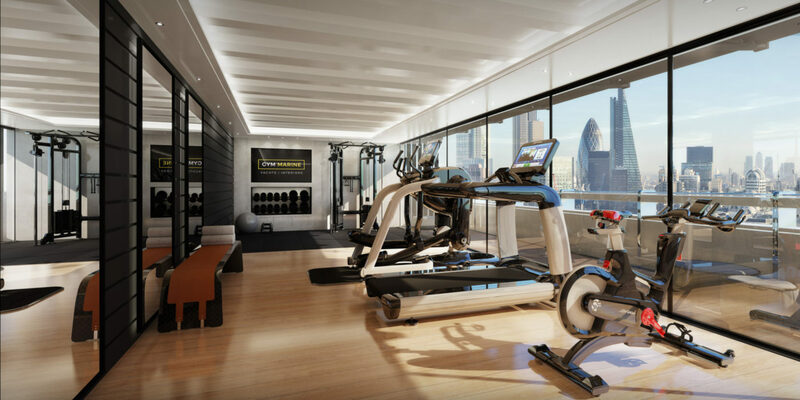 In fact, most of the challenges our gym design team face involve coming up with ways to help clients maximise smaller spaces in their homes and to turn them into functional gym areas. 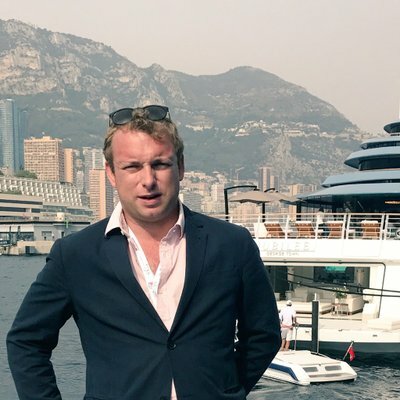 Normally it’s a disused bedroom or a garage that becomes a home gym, but sometimes clients create semi-permanent structures in their gardens, or even utilise conservatories or utility rooms for their new workout area. What gym equipment should I buy? This is a question with open ended answers, and of course depends massively on the goals you have set for yourself and the space available. A particular trick we often employ in home gym designs is the selection of multifunctional equipment in order to get the most out of the space you have allocated for your new gym. A versatile strength & functional training machine like a dual adjustable pulley or home multigym is a great choice for exercisers looking to perform weightlifting at home. A decent multigym will allow you to perform 100+ different exercises using various attachments, and all in a small compact footprint! Of course, most people who are considering creating a gym in their house will first be thinking about what home cardio equipment to buy. The great attraction of cardio in a home gym is the obvious benefit of not having to leave the house to thrash out a quick 10K…especially useful in the United Kingdom, where it rains more often than not! Our recommendation is always to select machines with a good home warranty, and also those with slightly more compact dimensions so you can claim back valuable floor space for stretching and other exercises. 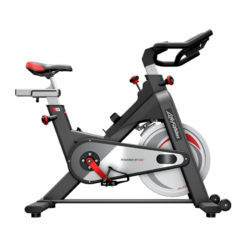 A cross trainer is probably one of the most popular machines amongst home gym clients, as it offers a low impact workout for the whole body and maximum calorie burning. If you are on a budget and don’t want to invest in larger machines, you can achieve incredible results with a basic selection of free-weights and gym accessories. A set of dumbbells and a bench are all you need for a total-body strength and conditioning workout, and you can get incredible cardiovascular training benefits with a simple skipping rope. You don’t need loads of space to use these items, and they are really easy to store when you’re finished. You might even want to take your equipment outside into the garden when the sun is shining! Beyond the obvious, there are a few key factors which need to be carefully considered when beginning a home gym design. As you’ll have seen above, selecting a room at the start of the home gym design process is perhaps the most important bit. Space is always a massive consideration, and you need to think carefully about the type of exercise you are planning on doing in your gym, and the floor area which it requires. If you plan on using the space for functional training activities such as free-weights or kettlebells, make sure that you have a good clear floor area and a place to store your loose items. 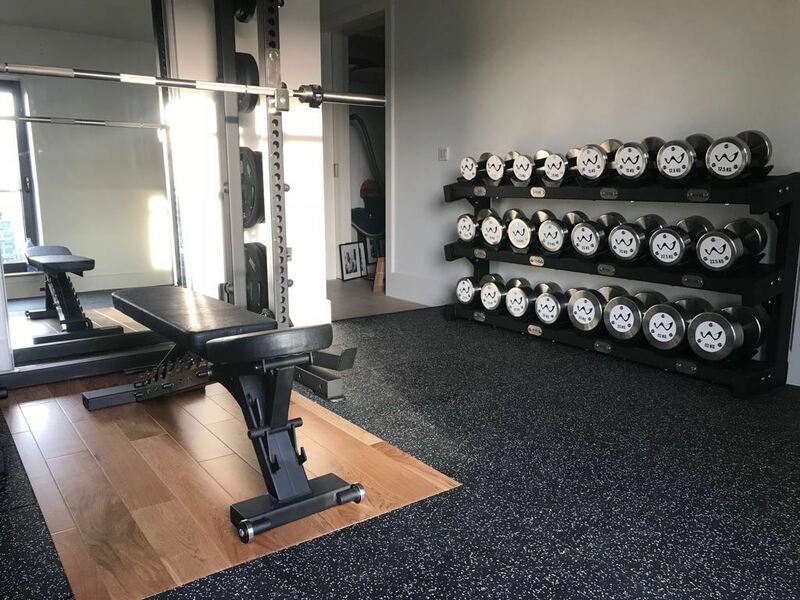 Storage is such an essential part of planning a home gym, as you don’t want your space to appear cluttered or have equipment in hard-to-reach places that inhibits the flow of your workout. You should consider making use of any cupboards in the room where you can, or even investigate options for custom racks where possible. An alcove or disused cupboard space is a perfect place to convert into a clever gym equipment storage space! Ceiling height is another key thing to consider at the beginning of the gym design process. 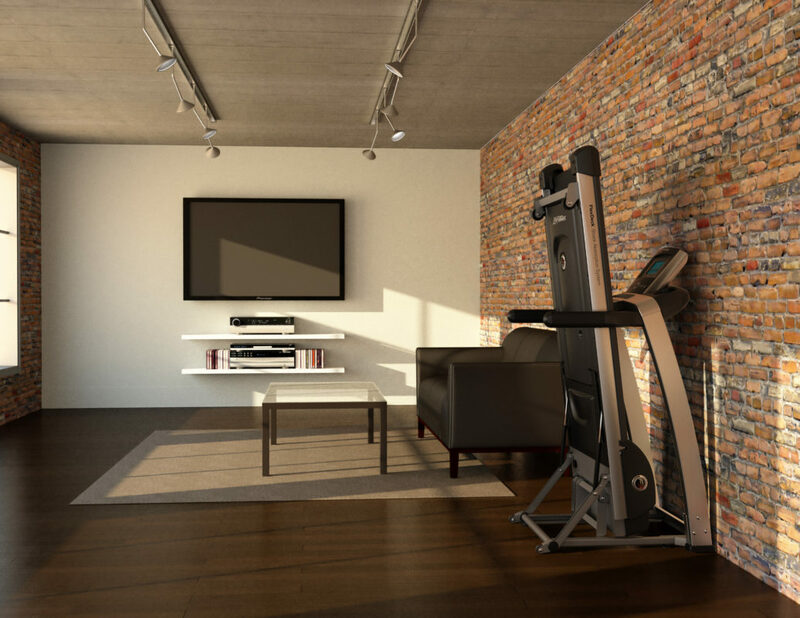 If you are a tall person and live in a house with average or lower ceilings, you may find that certain pieces of cardio equipment will not work in your home gym design as there is a risk of your head colliding with the ceiling during operation. Equally, studio style workout activities involving plyo-boxes or overhead presses with an olympic bar may not be possible. 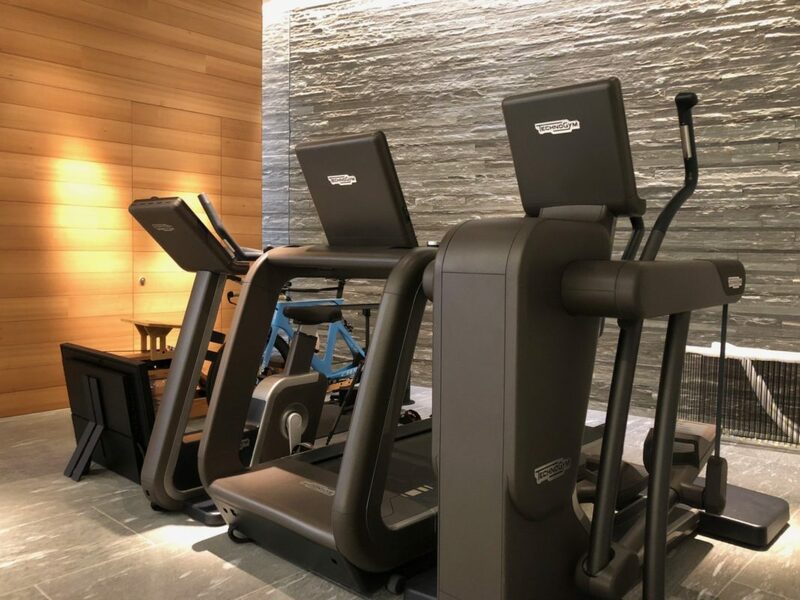 If you are remodelling your home and have the opportunity to do so, ask your interior designer or architect if a floor recess or ceiling dome is possible for your cardio machines – any extra height you can gain will make your home gym seem much larger and more comfortable to train in. Lastly, we always encourage our clients to ensure that they have great lighting and air conditioning in their home gyms. A bright, airy space will always be conducive to a better workout, and maintaining a correct temperature will ensure that you have a perfect environment to focus on reaching your fitness goals. 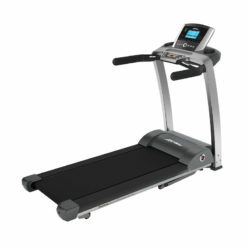 A folding treadmill is extremely space efficient and can be placed almost anywhere in your home. Creating your training program… and sticking to it! 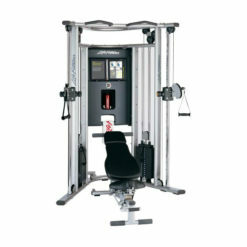 Once your new home gym equipment is delivered and installed, its time to get down to business. Now that you don’t have to brave the elements or drive into town to exercise, you should be in great shape in no time, right? Having made a significant investment in your gym, you should give equal consideration to spending some time learning about your machines and how to use them. You don’t necessarily need to splash out on a full time personal trainer, but it may be a good idea to get someone over to your house to show you how to use your machines and what kind of workout you can plan in your new home gym space. Make use of the internet and the huge number of online resources available to find out which techniques can be the most effective using the equipment you have – most home gym customers opt to put a television in their room, as you are able to follow online trainers on YouTube and take part in online class style workouts at home. So what’s next? 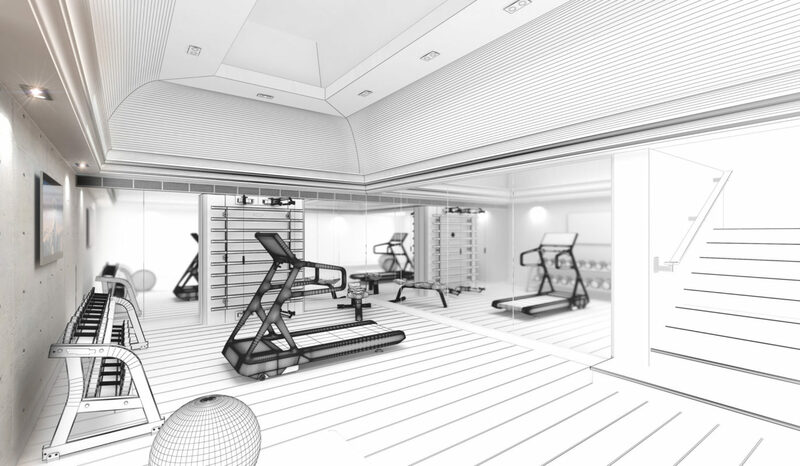 Well, if you’re interested in creating your own home gym design in partnership with Gym Marine Interiors you can contact us today for a completely free consultation. 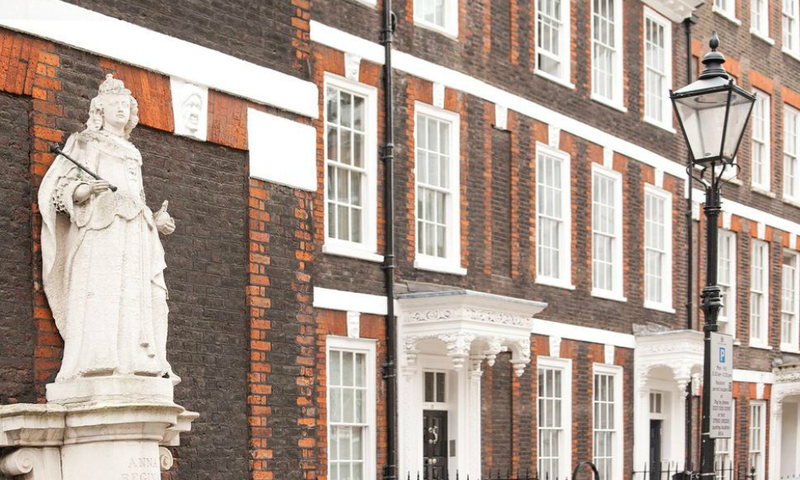 We can help with equipment selection, floor planning and all the logistical planning required to deliver the project. Or, if you think you have enough information to get going with your own design, you can browse our store to see what equipment is available to buy for use at home.